“Not all inequalities are created equal.” So goes one of the main takeaway messages from the Dialogue on Inequalities recently held in Istanbul. Yet we still use only one indicator—the Gini coefficient of income inequality—to judge them all. Back in 1968 Robert F. Kennedy said GDP “measures everything. . . except that which makes life worthwhile.” This holds true for the Gini coefficient as well—it measures all income inequalities, except that which make inequalities important for us. Life cannot be defined by income, just as quality of life cannot be measured with how much one get. Yes, access to a good education and health care does matter. And different countries in the world have very different models of provision for these things. On the one side of the spectrum are heavily market-oriented countries, like the USA, Singapore and Hong Kong. On the other side, one could find such countries relying on state in public goods provision, as Sweden, France and Germany. Therefore, social inequalities are as worthy of discussion as the Gini. Just look at Belgium and Bangladesh: They share, besides their first letter, a similar level of income inequality with a Gini index of 33. 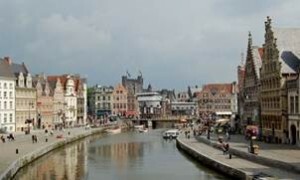 But when it comes to social inequalities, in education and health, Bangladesh performs four times worse than Belgium. Perhaps what matters even more than income inequalities is the sense of shared society. Singapore is a free market society, number one in “Doing Business” ranking, second in “Economic Freedom” score, with a very low tax rate. Not surprisingly, income inequality is quite high there, with a Gini score around 45. However, Lee Kwan Yew, the founding father of modern Singapore seems to have managed “to give every citizen a stake in the country and its future.” People in Singapore trust each other and state institutions, and only a few would call for more equal income redistribution. 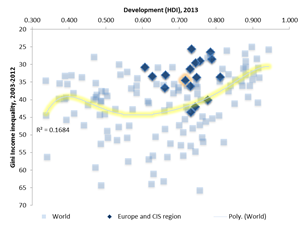 In contrast, countries in our region, despite relatively low income inequalities, do not perform well on this front. 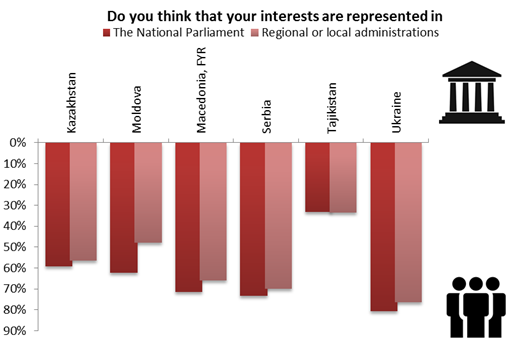 Recent findings highlight that in the most of the countries surveyed, the majority of people do not think that their interests are represented by the National Parliament or the regional and local administrations. Hence, one could suggest that this lack of shared society perhaps hurts people much more than differences in incomes. So how do we measure inequalities? These days, inequalities are quite high on the development agenda. Just look at the Open Working Group proposal for Sustainable Development Goals, which includes two goals on inequality. The Palma ratio has recently been proposed as a more meaningful measure of inequality. It proposes to look at the income share of the top 10% divided by the income share of the poorest 40%. (Assumption confirmed by statistics is that middle income groups between the ‘rich’ and the ‘poor’ capture around half of the Gross National Income). In this way, Palma may be much better at capturing excessive inequalities, or as we call it, “the bad and the ugly”. To capture Human Inequalities, UNDP proposed the Inequality-adjusted Human Development Index (IHDI) back in 2010. The index takes into account not only the average achievements of a country on health, education and income, but also how those achievements are distributed among its population by “discounting” each dimension’s average value according to its level of inequality. Finally, the World Bank offers a similar indicator, the Human Opportunities Index (HOI), which looks at how access to different opportunities—education, water, sanitation, etc—is distributed in a society. This could help us uncover how access to a particular right may be quite unequal across groups of children (urban boys vis-à-vis rural girls, for example). 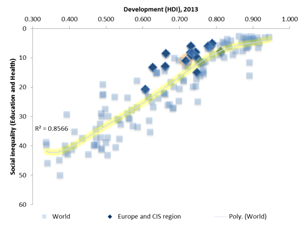 …but development and social inequalities are going together much more closer. All models are wrong, but some are useful. It is time to move away from relying on the Gini coefficient – and towards more useful indicators of inequality to distinguish between the good, the bad and the ugly inequalities. More equitable world we all want should not end up as the kingdom of uravnilovka and suppressing people desire and ability to take part in development. Join #TalkInequality conversation at Twitter. Have look on slides from presentation at “Dialogue on Inequality” meeting. 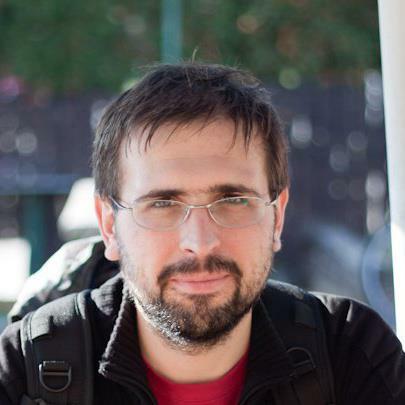 Well done, Michail! Inequalities are indeed highly unequal. A major – and still unaddressed in sufficient depth – is inequality of opportunities to exercise one’s fundamental rights. It is related to people’s aspirations and agency – all the critical aspects of the human development and social inclusion paradigms. But how do we exactly quantify and monitor those is still an open issue. The attempts to quantify these phenomena usually end up in measuring the subjective perception of the individual. Definitely better than nothing but still far from a truly robust measure of inequality of opportunities. 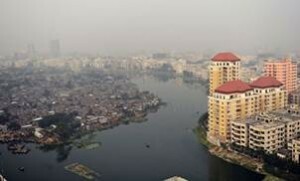 Pingback: Wanted: New Yardstick for Inequalities | Voices from Eurasia - We help build better lives.